French Emblems: Emblem: Vita mortalium vigilia. The life of mortals is a vigil. Ad D. Viglium Zuichemum Praesidem. Pars vitae est princeps: otia vita fugit. Hoc liber explicitus, clepsydra, lychnus habent. To stay awake over books, to measure out the hours in study, Is the chief thing in life: life flees idleness. Fame carries the wakeful on and buries the inactive in oblivion: The open book, the hourglass, the lamp hold this meaning. Our discourse here is not about that wakeful time, which we read that Maecenas, whose fame is immortal in the writings of all, suffered for three whole years, in which time he could move the softness of Sleep with neither libations, nor sacrifices. Rather it is about the watch which Demosthenes, the chief and lord of orators, kept, in which he was accustomed to anticipate with great exertion the early-morning productions of journeymen. Or about the vigil the emperor Julian kept when he would divide the night into three watches - one each for quiet, for his country, and for the muses. Or about the one in which Alexander the Great would rest his arm on a bronze vessel and massage a silver ball in his hand, which, when his sinews relaxed in sleep and dropped it, would strike the bowl with a ringing tone, at which he was accustomed to wake up. Or about the one which Pliny calls the true life that flourishes especially in those whose restless souls are sustained on work: which with patient ears you will not refuse to have said of you, most vigilant Viglius - for led by this you have hitherto burnt the midnight oil over so many matters for the benefit of the provinces, and not without damage to your health; and led by this you have acted as President of the Council for so many years now, and have caused to shine on yourself and your kindred a light of everlasting glory, whose radiance shall shine inextinguishably as long as the world shall last. Accordingly it behoves us who are led by the love of true glory [p.76] to endeavour with all our might, by taking thought for the state and the common good, to bear witness to our having been truly alive for many hours, and having kept back a share from Sleep the thief -- or (as Aristo put it) the tax-collector -- of time, who embezzles half your life. For worthy, and praiseworthy, stewards of time have as their follower that eternal flame that is never extinguishable even by death, glory the attendant of true virtue. 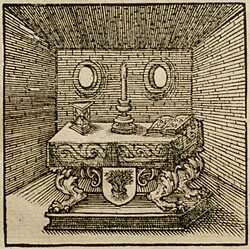 Viglius’s well-known emblem is to be painted: in it, on the one side, the open book to denote careful industry, on the other the hourglass as an argument for Time being carefully allocated, and in between these the candlestick with the burning flame as a witness to posthumous glory - these will present themselves all at the same time for representation set on a funeral couch. 1. Viglius Zuichemus (Wigle Aytta van Zwichem): Dutch statesman and jurist, prominent in the government of Margaret of Parma in the 1560s (President of the Council). Also a scholar, and friend of Erasmus (d. 1577). 2. There is doubtless a play on words between vigilia ‘vigil, wakefulness’, and Viglius, the Latinised name of the lord president to whom this emblem is dedicated. 3. C. Cilnius Maecenas, the boyhood friend of the emperor Augustus, is celebrated as a patron of the arts in the writings of Vergil, Horace (see Emblem IIII, [FJUb004]), et al. 4. Ariston of Chios, the Stoic philosopher.